Take a look at any celebrity news outlet these days and — among the stories about baby bumps and luxury delivery rooms — another parenting theme has emerged: adoption. Dozens of stars, from Sandra Bullock to Katherine Heigl to Charlize Theron, have all famously adopted children recently, often going out of the country to do so. International adoptions were indeed on the rise for years, but despite the fact that half the members of Angelina Jolie and Brad Pitt's brood of six hail from foreign countries, or that Madonna and her two adoptions from the African nation of Malawi made headlines, the number of Americans adopting from outside the country has actually plummeted recently, thanks to a variety of complicated factors including the enforcement of an inter-country adoption treaty, which has forced some agencies that can't comply out of business, as well the uncovering of corruption in certain nations. Of the approximately 130,000 or so adoptions that took place in America last year (of which, more than a third consist of a stepparent adopting a stepchild), surprisingly, less than 10,000 involved children from overseas. The majority of the remainder, according to Adam Pertman, executive director of the Evan B. Donaldson Adoption Institute, are adoptions from foster care, and — despite the little ones we see celebs taking home — those children are rarely babies. Over just the past year, stars including Denise Richards, Kristin Davis, Viola Davis and her husband, actor Julius Tennon, and Mariska Hargitay and her husband, actor Peter Hermann, have introduced the world to their newly adopted infants. So does that mean they received special treatment because they're rich and famous? Indeed, celebrities may wind up with an advantage when it comes to adoption, but the benefits usually stem from being rich, not famous. "Adoption outside of foster care, particularly so for infant adoptions and international adoptions, has come to be quite expensive and that locks a lot of people out," explains Pertman, who is the author of Adoption Nation. "Does power, influence, money make a difference? Yeah, it does in every realm that we're aware of, but a wealthy surgeon probably gets the same sort of treatment as a wealthy movie star, just that nobody's following the surgeon around with cameras." "Those are arranged through attorneys and there's typically a pretty big price tag that goes along with that," explains Deborah Johnson, a Minneapolis-based, adoption-focused social worker, of private adoptions, which enable the adoptive parent to adopt a baby, often a newborn, via that speedier process. "It's basically where an attorney will have a connection to some social service agency or they'll advertise or they'll go through different sources and it's really about the more you can pay. Even 20 years ago it was $30,000 or $40,000. "While Sandra Bullock adopted her now-2-year-old son Louis from the Louisiana State Foster Care system in 2010 (she actually reportedly began the adoption process four years prior with then-husband Jesse James, but completed the adoption alone after their separation), more often than not celebrities go the route of private adoptions, which can cost anywhere from $40,000 to $100,000, and thus they end up with a child much faster. Denise Richards has said the process of adopting a child (she brought daughter Eloise home last July when the girl was just a few weeks old) took two years. While that may sound like a long time, adopting an infant can often take three, four, even five years. 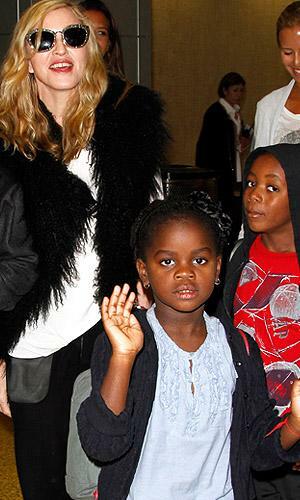 While many celebs — and average citizens, for that matter — quietly go about the process of adoption, only announcing the new family member once it's all official — that was far from the case when megastar Madonna and then-husband Guy Ritchie began their attempt in 2006 to adopt toddler David from one of the world's poorest countries, Malawi. The nation has a rule that an adoptive parent must reside in Malawi for 18 months before being allowed to take custody of the child and Madonna's battle to take home David — who was living in an orphanage at the time — made headlines as she fought for nearly two years to legally adopt the boy. She found herself in the same situation a few years later when she adopted a second child from the country, a little girl named Mercy. Despite the lengthy process, many — including advocacy group Save the Children — still believed she got special treatment and criticized the adoption since both children had family members in Malawi. "The idea that people think I got a shortcut or an easy ride is absolutely ludicrous. I have never worked so hard for anything in my life, and I've never been given such a hard time," Madonna told Time magazine while she was in the process of trying to adopt David. "And my celebrity has worked against me in every way." With many countries scaling back on adoptions to the United States, the waits can be longer and the children are often older or have special needs. Katherine Heigl and her husband, musician Josh Kelley, adopted daughter Naleigh from South Korea in 2009. At the time, they announced that the 10-month-old was indeed a special needs child, and the couple later revealed that their daughter suffered from a congenital heart problem that required open-heart surgery prior to leaving Korea. Heigl (who grew up with a sister adopted from Korea) and Kelly have recently adopted a second child, though they have not revealed any details. "After the story was told, there's no evidence she got to the head of any line," concurs Pertman. "I'm not saying what should or shouldn't happen, but some of the quote 'understanding' of these stories gets lost in the glitter." While a family with means adopting a child from an orphanage in a poor country might seem, on the surface, like the best thing for the child, not everyone agrees. Some adult adoptees from foreign countries who were brought to America in the '60s, '70s, and '80s have banded together, creating a grassroots movement over concerns that their birth parents were coerced into giving them up for adoption. "There are a lot of people in the international adoptee community who really have some strong negative feelings about transracial and international adoption," says Johnson, who herself was adopted from Korea as a child. "They're sitting back and being a little more cynical about it and are kind of voicing that concern. It's even more evident when you have [adoptive parents] who are super wealthy, super rich. Even on a subtle level, if you're a poor villager in Guatemala and some rich famous celebrity swoops in and says, 'I can give your child a better life,' it's pretty easy to be dazzled by that." Though most adoptive parents follow every rule and take every precaution when adopting from outside of the country, it can be impossible to know a child's background for sure, insists Johnson. "American agencies will say, 'Well, we don't know what goes on in the intake process into orphanages. Yes, it's legitimate from the time they're into their U.S. adoption, but who knows how those kids wind up in the orphanage and what those birth parents are told about all of that." Perhaps no star couple is as associated with international adoption as Angelina Jolie and Brad Pitt. In addition to their three biological children, the couple is raising 10-year-old Maddox, adopted at 7 months from an orphanage in Cambodia; 7-year-old Zahara, adopted from an Ethiopian orphanage when she was six months old; and son Pax, now 8, who was 3 years old when he was adopted from an orphanage in Vietnam. Jolie has often said that she and Pitt, who recently got engaged, teach her children about their respective cultures and have even taken a family trip back to Vietnam so that Pax can see his native country. For parents of a different race from their adopted children, that's an important part of raising them, notes Johnson. "Especially if you are wealthier, there's really very little excuse for you not to have some sort of connection and the ability to foster that cultural pride," she says. "I think keeping kids connected with their cultural roots and helping them shape their identity as a Vietnamese-American or Somali-American, just going back to visit their birth country once a year, that's a good beginning, but there's a lot of work to that. Kids can feel very disconnected from the cultural communities in the U.S. "
That disconnect can be amplified when children are being raised in wealthy, often mostly white, communities. "That's my concern with these celeb kids," Johnson adds. They get to live in these little ivory towers for a while. Their parents' celebrity and money kind of protects them, but eventually that's not going to be the case and how prepared are they going to be when they have to go out and navigate the world?" Still, the effect of international and transracial adoption has been transformative. Just a few decades ago, many Americans didn't look fondly on interracial relationships or multi-racial families, and adoption has only helped in terms of acceptance, with celebrities playing an important role, says Pertman. "If adoption were invisible as it was for generations then nobody learns anything and nobody thinks it's happening. When it is very public as and celebrities are a part of making it very public then it normalizes all sorts of families," he explains. "Single celebrities adopt as single parents. Celebrities adopt transracially, so transracial families get more visibility and people feel like hey, that must be okay. There is a distinct positive aspect to normalizing all sorts of families including adoptive ones."